It would look even more convincingly like a wobbling top if I had a way of rotating around it to keep the apparent phase constant. As is, both "follow" and "rotate" give an almost identical wobbling terminus because neither accounts for both directions of rotation. 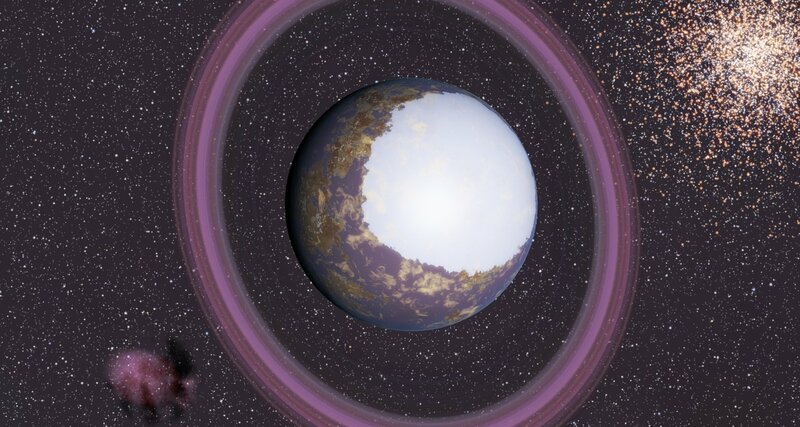 A couple of oddities with this world RS 8411-1-5-28127-227 7 in 0971: It has big polar caps, yet very large seasonal variations. The axial tilt is 159 degrees, but it doesn't look like that when I speed up time. 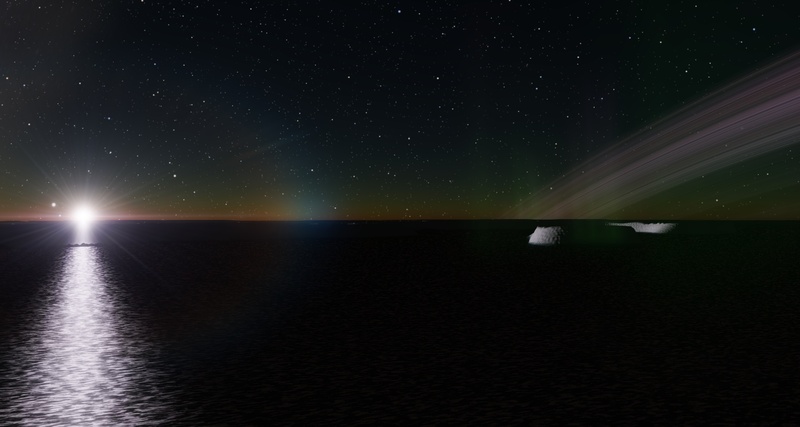 It also has aurora reaching sea level. Which might be the case on alien worlds for what I know. But it also makes aurora visible in front of pretty close objects, which doesn't seem realistic. It must be a bug in the case of this planet; the aurorae are shown extended down beneath the seabed, which is clearly impossible. 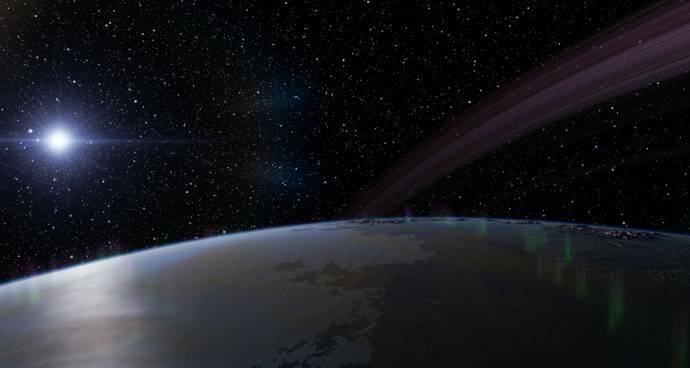 Aurorae are coded (I think) to begin at the atmosphere height of the planet, so something must be bugged in this particular case. I made a gif showing the polar caps and the extreme seasonal variations, which does not at all look like the listed 159 degree axial tilt. Why are there unknown stars? Considering that is a cataloged star I would assume there is an error in the catalog listing. If you list a spaceship or planet wrong you get an unknown type. which does not at all look like the listed 159 degree axial tilt. It orbits a barycenter with its satellite; the axial tilt is probably erroneously given relative to its orbit around the barycenter rather than around the sun. A supergiant orbiting binary black holes. I don't see anything anomalous about this, Solid_Granite. It's just an evolved high-mass multiple star system. There should be many such systems across the universe. It is an interesting find (and I'd love to know where that is... coordinates? ), and considering how rare heavy stars are overall, it should be pretty rare indeed. But still, if one considers the number of star systems there are in the universe (and even in Space Engine's universe), there should be quite a few examples of this kind of needle in such a humongous haystack. And again - not an anomaly. Binary system right next to the center of a star cluster, with 21 planets, 16 if which have life.